f.lux – Better lighting for your computer | Htbaa blogs? 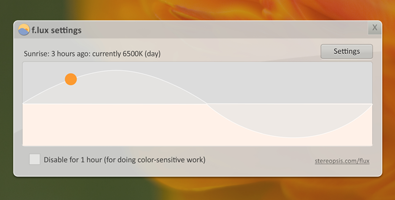 I don’t remember how I bumped into this one, but f.lux is a really nice piece of software that adapts your screens colors depending on the time of the day. After the sun has set it transitions your screen to a warmer color palette that’s a lot easier on the eyes when the lighting in your room gets less as well. It’s especially nice in the evening as you’re not really looking into a big source of light anymore. Well, you are, but it’s not that blueish light anymore and if you’re using a laptop reducing the brightness improves it even more. F.lux is available for Windows, Linux, Mac OSX and iOS (requires jailbreak) and is freely available from http://stereopsis.com/flux/.